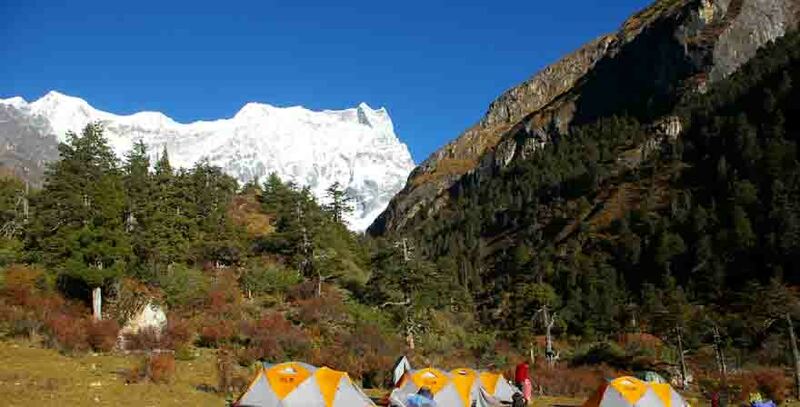 Nabji Kurphu Trek is a perfect combination of trekking, camping and exploration of natural and cultural heritages of Bhutan without having to undergo extreme physical or mental strain and hassle. Bharal Adventure understands the value of travelling. Therefore, this is the best package for the trekkers to witness all forms of the trekking in Bhutan. Witness the ever growing Bhutan in terms of the adventure and culture in the single trip. This trek takes you to the peaceful and distant lands in Bhutan. Here you can have your own romances with the beautiful and picturesque landscapes and culture of Bhutan. It’s an excellent way to observe and explore the affluent natural and cultural heritages of Bhutan. Nabji Kurphu Trek is a 13 day journey. It is an easy trekking in Bhutan. This is termed as easy trekking in Bhutan which enables trekkers to enjoy the delights of the Bhutan. Also in terms of the culture and nature without letting body to endure the pain. If you desire to spend a holiday where you can rest in a luxury hotel today and camp on the outskirts of cities the next day. This trek is especially designed by keeping that desire of yours in mind. 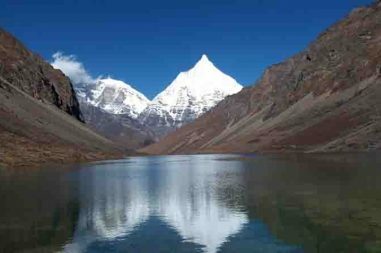 It is an ideal trek option that takes you to the markets and monuments in centers of major cities. Also to the faraway lands that gives you the experience of indulging in local culture and tradition. Its still untouched by globalization and urbanization. Bharal Adventure Pvt. Ltd. has the strong connection with this small dragon kingdom of South Asia. In conclusion you will have the mesmerizing holiday without any fear of hassles. Travel with us and get your investment on travelling returned back to the fullest. 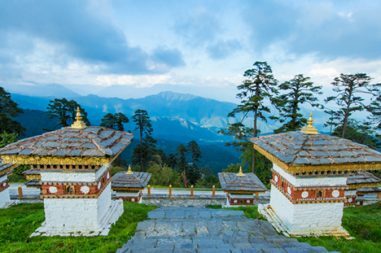 Once you arrive at Paro airport, you will be received by one of our representatives who will take you to Thimphu in a private car that will take about an hour long drive. After arrival, you will check into your hotel and take rest and freshen up. Then in the afternoon, a visit to Memorial Chorten built in the memory of late 3rd king and drive to Buddha viewpoint for visiting the largest Buddha statue in the world will be arranged. Also a visit will be arranged to oldest temple in the valley, Changangkha Lhakhang where the national animal Takin is kept. You can either choose to relax at your hotel room or explore the city in the evening. Taking a scenic drive via Dochu La Pass (3,050m) we come to Punakha taking one break at the last town on the highway before entering into central Bhutan. We will visit the nunnery and walk down to the hotel in the afternoon. We will walk to Chimi Lhakhang, the temple of fertility associated with religious art of phallus. On the way, we will visit Wangdi town and continue our walk to Trongsa climbing over Pelela Pass at the height of 3,300m. As we arrive at Trongsa we will visit the Trongsa Dzong, a fortress that used to rule the kingdom and is home to the royals. We can arrange a leisurely stroll around town or could relax in the hotel room in the evening. The first day of the trek begins with the short tour through Trongsa Dzong and its Ta Dzong that are strategically located above the Mangde River. Taking a bus from here, we move towards Zhemgang to take a stop at Riotola at the height of 1,060m which marks the beginning of Nabji trail. You might also catch the sight of a deer or macaques as you travel along the beautiful Mangde valley. A steep descent of 693 meters to the bed of Mangde River marks the beginning of our trek. After one and half hour of our walk, we arrive at Matling from where 30 minutes further will bring us across a chorten indicating the entry to the Nimshong village which is a steep climb for about another two hours from the river. You are welcomed by the villagers with dance and songs while the cooks prepare dinner, giving you a festive feel. We will camp just beside Nimshong Community School above the village. We begin the day by visiting a local temple from where we will hike through a lush broadleaf forest that comes alive with the abundance chirping of birds and mammals. We might as well get the opportunity to catch the sight of Golden Langur and Rufous-necked Hornbill. Although the elevation of Nabji is similar to that of Nimshong, the trail goes up and down the hill through dense forest making the trek exciting and thrilling. Nabji means ‘promising’ or ‘oath’ and the temple of Nabji harbors the stone pillar to mark the peace between Bumthang and Assam Kings. Also the rock remains of a blacksmith, one of the reincarnations of Pema Lingpa, can be found in the village. We will be camping in the open area surrounded by rice fields in Nabji. This day will be spent on acclimatization and exploration of the area. From our base camp at Nabji, we will take a day hike to Korphu village situated on a mountaintop at the altitude of 1,500m. The hike is spectacular filled with the views of the clustered settlement. Also a visit to Korphu’s temple housing the sacred relics of Pema Lingpa will be made. You will be served a local lunch in the village and it is only in the afternoon that we hike back to Nabji. Following the trail to Kubdra village, we walk across the dense forest comprising of big trees with clippers, orchid and small bamboos. After walking for about five to six hours, we can take rest at the benches provided as we enjoy our lunch accompanied by the beautiful view of a waterfall at a place called Zhelyung at the height of 1,565m. A few hours walk will bring us to the Kubdra where the ethnic group called Monpas reside. Situated in the middle of the forest, Kundra requires around six hours walk from Nabju. We will set our camp here for the night. Continuing our hike from Kubdra, we find the traces of Guru Rimpoche in the form of foot print, dragger and hat. We will make a short visit to the small village of Phrumzur at the height of 1,400 meters where a temple is located. Our lunch will be served here and after lunch and enjoying the view for a while, we will continue our hike along the pristine forested trail. We are welcomed by a warm cup of tea in the orchid garden in Jangbi where we can learn more about the Monpas and their Cane and Bamboo Project. We will set our camp close to Jangbi village overseeing a beautiful view of the valley and Mangde Chhu. Taking a steep descent of 950 meters, we come across a bridge that crosses over the Mangde Chhu. From here, we will climb to Tongtongfey where the bus will take us to Trongsa marking the end of our trek. 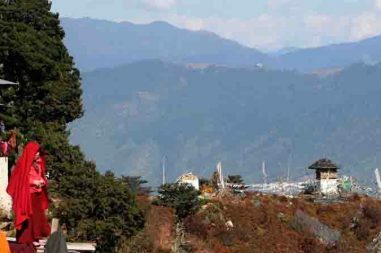 We can also visit the Kuenga Rabten Palace and the Nunnery in Trongsa if time permits. On this day, we drive to Phobjikha, the valley of black necked cranes that migrates from Tibetan plateau every winter. Upon our arrival, we visit the famous Nyingmapa Monastery in black mountain region and then in the evening, we talk a walk in the beautiful valley of Phobjikha where we can meet and interact with the locals and students. We take two hours walk along the trail and then drive back to Paro via Wangdue, Dochula and Thimphu after breakfast. Upon our arrival in Paro, we will visit the National Museum of Bhutan to observe the collection of natural history to religious paintings. Then we will visit Paro Dzong during the afternoon. In the evening, we will explore the town and market area of Paro. After breakfast, we will explore cross a traditional cantilever bridge, Nyamai Zampa, we drive to the town where we can either visit a traditional farmhouse for lunch or have our lunch at the picnic spots available. We will then hike to one of the most revered monuments of Bhutan, the Takshang Gomba which is commonly referred to as the “Tiger’s Nest”. This four hour trek is rewarded with the picturesque views of the monastery perched on a cliff face at the height of 900m above the valley floor.